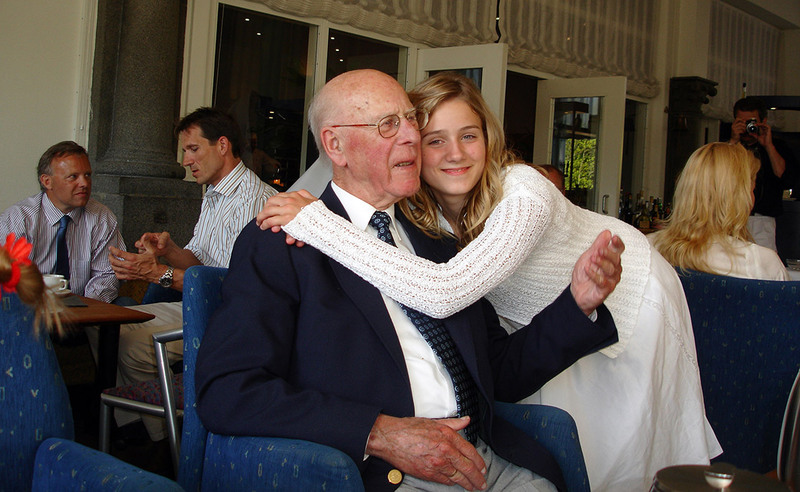 My grandfather, who is sadly no longer with us (died last year) and seen here with my niece, once told me something brilliant. Always have one extra month of salary in your bank account. It's such a simple advice, and yet so brilliant. Having a full month salary as a 'buffer' in case something goes wrong, is perhaps the most important thing I have ever done with my money (after spending the first 10 years of my life in crippling debt). The peace that it gives you is immense, and it gives you the space to make better decisions. Thank you for that grandfather! Today, I have extended the same line of thinking to my business. My goal is to always have one year of revenue in reserve. So before I even started, that was what I saved up for. True, there have been some very sketchy moments during the past five years (I made so little money the first two years that I basically used up all my reserve money), I'm now getting close to reaching that goal as well. That is, I now have (almost) one full year of revenue standing, in reserve, on my bank account ...in case something happens. Build up enough buffer so that you have one year of buffer. ...or rather, it was my grandfather's advice. Stop having an 'exit plan', start having a 'I will be doing this forever' plan. And of course, all the very successful companies do this as well. Apple does (almost). It had $182 billion in revenue, and $155 billion in cash reserve. Google does. It had $29 billion in revenue, and $35 billion in cash reserve. New York Times is trying to have it. It had $1.5 billion in revenue, and $1 in cash reserve. IKEA is also close. It had $29 billion in revenue, and $17 billion is cash reserves. Not to mention, most VCs have this as well. Many other companies don't have a year's revenue in reserve, but a year's cost in reserve. Meaning that, even if they completely stopped selling all their products today, they will still be able to pay all their expensive (salary, buildings, etc) for a full year before going bankrupt. I have seen startups who are starting out with no money. So instead of building something great, they are forced to pitch whatever idea they have to VC before they even know if they can do it (and it usually ends in tears). Mind you, I have nothing against VCs as such. If you have a really great idea and you can match that with an investment from a really great VC, what they are essentially doing is to give you enough buffer to make your idea come true. The problem I have with VCs is that it's just a loan. They expect to get a return on their investment, and in a fairly quick manner as well. This has a tendency to produce only a certain type of startups (those who focus only at creating platforms at scale), which isn't always the right model for your idea. I have also seen startups only saving up enough to pay their expenses for the next two months, giving them so little time to build their new business that they fail before they even start. No matter what, you need that one year of buffer. Not just for the money, but also for the time that it allows you to have to focus on the long term.